PITTSBURGH—Stressing the importance of giving back to those who are much less fortunate, members of the Pittsburgh Steelers reportedly spent Friday making surprise hospital visits to spend some time with opponents they’ve injured. “We try to do something nice like this as often as we can—we just hope to put a smile on some faces here and hopefully help them forget about all the pain they’re going through,” said second-year linebacker Bud Dupree, adding that the team brought gifts and spent time playing video games in an attempt to lift the spirits of players who are enduring debilitating conditions suffered while playing the Steelers during the season. “You can tell it means a lot, and it’s very inspiring to see how they stay positive and never give up despite all the terrible things we’ve put them through. 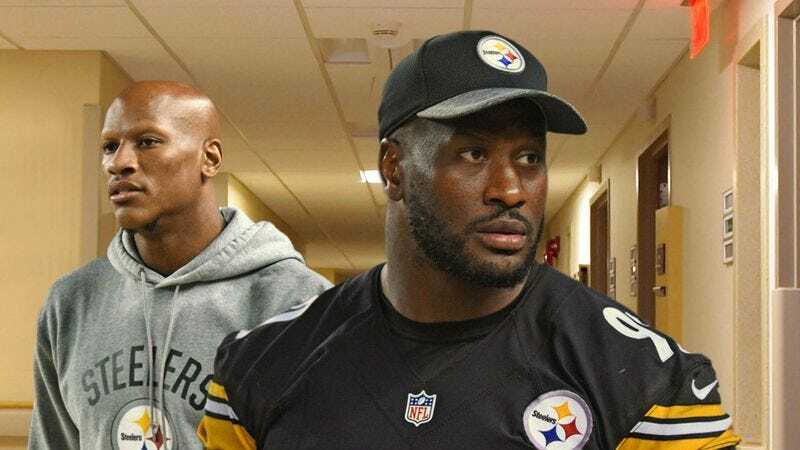 They’re really brave.” At press time, the Steelers had presented UPMC Presbyterian Hospital with a $500,000 donation check that will go toward a new wing dedicated entirely to treating victims of James Harrison.